Highest Certified by CGC! A comic with two covers? No, it's not the work of the Prankster, but a rare binding mistake that makes this copy very desirable. You do get a Prankster story in the bargain though, as well as a Congo Bill yarn and a Mort Meskin-drawn Vigilante tale. The cover, featuring the Comedy King himself (irking the Man of Steel once again), is by Wayne Boring. CGC notes, "1st cover 9.6, interior cover 8.5.". Please understand that CGC has assigned the lower of the two cover grades to the label because of the Tan to Off-White pages. Had the pages been "Cream" or better, they would have placed the 9.6 cover grade as the dominant grade on the label. 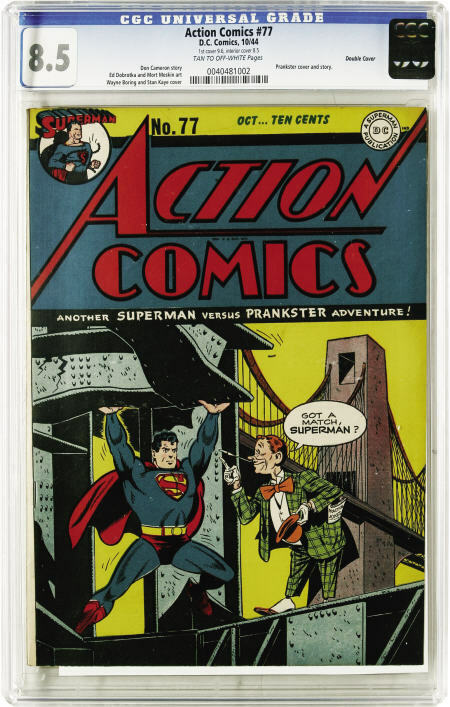 Regardless, you are bidding on an Action Comics #77 with an outstanding 9.6 cover.